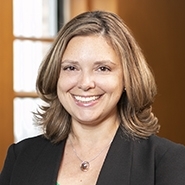 Ellen Menscher returns to Herrick as counsel in Herrick’s Real Estate Department. Ellen represents clients in all aspects of complex commercial real estate in New York City and across the country, including acquisitions, sales, development, commercial finance, land use, and cooperative and condominium law. She has a passion for the development of real estate and works closely with clients throughout the entire life cycle of a real estate deal. Ellen consistently works with private developers and investors in joint venture negotiations and represents them in the acquisition, financing and development of high end commercial and residential properties in New York City. Ellen also regularly works with borrowers, lenders and investors on real estate financing transactions, including construction loans and refinancings of all kinds. She also advises clients in condominium and cooperative law from the preparation of an offering plan through the closing of unit sales. Ellen’s work includes representing developers in the preparation of offering plans for new condominium construction projects, sponsors in the preparation of condominium and cooperative documents and unit owners in obtaining no-action letters from the New York State Attorney General’s Office.